For a long time, the question of what my “style” is has vexed me (ironic, I know, given my profession!). Prior to learning to sew, it felt like a moot point anyway: there was so little available in shops to me, that I basically wore whatever was available and fit, which meant I mostly wore Boden wrap dresses and camisoles. But of course, sewing changes the whole equation! You can have any garment, in any size, in any colour, in any fabric… it’s a little overwhelming at times. 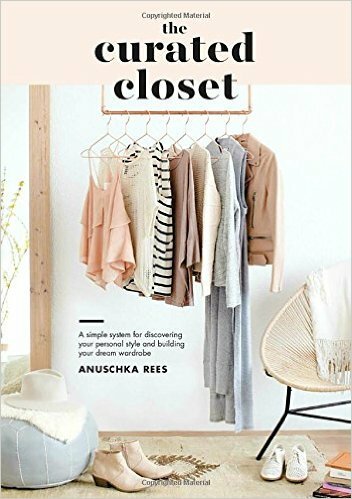 So when I recently heard about the book “The Curated Closet“, by blogger Anuschka Rees, I was intrigued. 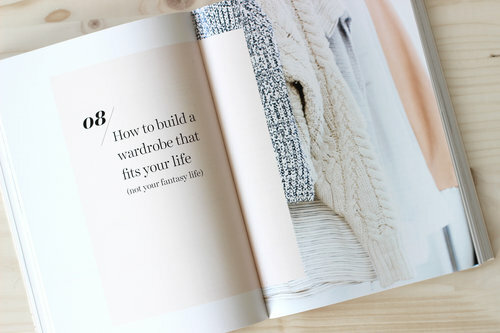 It’s a book to help you define your style and build your wardrobe. She has guidance to help you put together a capsule wardrobe (in line with this month’s theme! ), but the book is not prescriptive in any way. Rather, it’s about sharing a process by which to assess your clothing preferences and lifestyle, evaluate how your wardrobe is currently serving you, and then how to bring it all together. It works equally well if you’ve got a corporate job, go to lots of parties, are around kids all day, or are super tempted to wear yoga pants and work from home all day while drafting patterns (ahem). When I set out to read The Curated Closet, I had two open questions: first, how well would she deal with non-sample size bodies? I have zero tolerance these days for any whiff of body shaming. And second, how would it apply to those of us who sew most if not all of our clothes? The verdict: very well in both cases! The first key point is that because Rees’ book is about a process and not a formula or “style guidelines”, it can fundamentally work for anyone of any size, shape or stylistic inclination. She tends towards minimalism, but actively encourages you not to limit your wardrobe if that’s not what makes you happy. I was really impressed by the methodical approach, which gives you structure without telling you that you desperately NEED a little black dress for all occasions. “In recent years we have all been so inundated with typology-based advice, from various body-shape theories to super in-depth color analysis quizzes, that the idea that only a small set of clothes and colors works for each person has become widely accepted. And that’s pretty sad. ….. If something is your style and you love it, I believe you should wear it, regardless of whether it supposedly “flatters” your body or doesn’t. Plus, if we are being honest, to flatter almost always means “makes you look thinner” and that definitely shouldn’t be your prime objective when it comes to getting dressed” (p. 57). The only reservation I had as I went through the book was the step where she encourages you to go into stores and try on lots of different garment shapes, silhouettes and colours, to see what suits you. Yeah. Even remembering having to go shopping in clothes stores sent a shiver down my spine; the more I thought about it, the more I realised that there are practically no in-store shopping options for me in Boston, which is a pretty major city. It’s totally absurd – I’m a size 16/18-ish at the moment, which is eminently average in America, but the idea I could walk into a store and have a range of high quality, diverse, garments to try on is ridiculous. Sigh. But luckily for me, I sew. Which brings us to the next consideration: sewing. If you sew, that’s fabulous news, because our non-sewing friends are restricted by what’s available in stores which makes doing The Curated Closet process much harder. Instead, we can identify gaps in our closets and then go off and make them. I found that there were only a few sections in the book that weren’t so relevant for me – for instance, I don’t need a guide to assessing the quality of store-bought clothes, because sewing has already taught me that. But the vast majority of the book is totally relevant, and it simply means that instead of a to-buy list, I have a to-sew list. I did reserve back a few things I wouldn’t wear myself for gifts for others, kid sewing, or pocket bags and facings and so on. As I went through, I also took the opportunity to catalogue what was left, using the Cora fabric stash app. I’m a total convert! You take a photo of each fabric, and then fill in various fields about length, colour, content etc., along with notes about what you plan to do with it. Now I am left with 35 pieces of fabric, and I can search them any time I want. So much better than fearing a fabric avalanche every time I go in my sewing room…. So my final verdict: The Curated Closet is a fantastic option if you’re a methodical thinker who’s dying to define or revive your personal style. It’s body neutral-to-positive, and I can’t wait to complete the entire thing! Have you read The Curated Closet? What did you think of it? If not, does the concept appeal to you? I’m working through this book now and boy did I find the inspiration collection/cull helpful! It made me realise the extent to which I’ve been feeling limited by what’s available in RTW in my size (now that I live in the U.K., not a lot!!) and Jenny, your post was a total breakthrough to me — I can just make what I want!
? I honestly can’t believe I didn’t realise this before. Looking at the pictures I curated for inspiration, it’s obvious I’m not dressing the way I’d like to dress. Was curious to see how other people dealt with the “just go try on tons of things” chapter (ha ha, very funny). I’m planning to just fine-tune my list based on what I already know about fits/cuts/etc from years of experience! I decided to go through my closet, etc to see what was missing, needed replacing first. Oh my goodness! I have spaces!!!! on my closet rod lol. Before it was crammed so tight everything was wrinkled and it was hard to get things in and out. Next is the fabric stash, then the pattern stash. I love doing this kind of thing. Four bags to consignment so far – a lot with tags still attached. They were for a former life. I retired a year earlier than first planned. Wonderful – but I can only wear so many suits and pencil skirts lol. Ditto the above request for a Cashmerette blazer pattern! Wouldn’t that be fabulous?! It can be a simple, shaped jacket. I would love that. I’m on the waiting list for this book at the library–your review is very helpful, I’m looking forward to reading the book. The other book I have really enjoyed on a similar topic is How to Have Style by Issac Mizrahi. Definitely a picture book but some nice tips too. I bought it used and refer to it often. Thanks for this review, Jenny! I actually have this book in my birthday wish list for this year. I’ve been following her blog for a while and have always found her posts very insightful and interesting. Happy to see you found ways to explain to fellow sewists how this resource can also be beneficial to us. I’m currently working on clearing out my wardrobe after a major move and life style change. Looking forward to reading this book. Just as an fyi the Cora app was iphone/iPad only. For those with android there is a terrific app called sew awesome. Tracks the fabric, thread, sewing machine feet and needles. Has convienent light and tools settings. Thanks for the android app heads up, Laura! I was hoping someone would finally make a Cora app for us non-Apple peeps! Thanks for this review! I’ve just requested this from my library and am interested to give it a read – with moderate expectations because I make it a rule now not to expect a new way of doing things that will improve my whole life! But it sounds like there is plenty of useful stuff to be had from this. Even just your review has prompted me to donate two of my skirts I’ve been hanging on to because they are technically my style, and they’re well made (by me) But… I just don’t feel excited about them and I never wear them. So time for them to go. I struggle with the capsule wardrobe stuff because of that emphasis as you said on having to have specific kinds of items, or needing to have, say, x-amount of tops and pants. I don’t wear pants, and I prefer dresses overall. I mean obviously you can adapt any capsule program but it’s extra work and makes it more likely I’ll end up with stuff I don’t wear. And also I feel fine having something in my wardrobe that I only wear a few times a year but love when I do. It sounds like those things have a spot in this book. I’ve ended up with quite a curated wardrobe by accident, through sewing lots and being ruthless in getting rid of what I don’t wear. But now I need to work on working out are there styles I would like to try that are better bets than others? I also feel like I’m ‘behind’ in developing my own style because of that thing you said where for so long I had to take what I could get – I didn’t have much spare money, and barely anything fit, so I just bought what I could afford that fit me. And I felt miserable in it. Clothes and appearance aren’t the most important things in the world but boy, feeling like you are in control of how you present to the world? It’s POWERFUL. Especially as a fat, gender diverse, feminine presenting person. There’s lots about how the world sees me that I can’t control, it feels good to take a firm, deliberate grip on some of that stuff. Just wanted to tell you to not stress over the idea of one capsule wardrobe. The concept behind capsule wardrobes is to make life easier for you and help you to not have to struggle with figuring out what to wear everyday. If you like and prefer wearing dresses everyday, then you actually have it pretty easy. You can make for example, a work capsule wardrobe for every month/ season (whatever frequency you prefer) that’s just dresses with a variety of accessories, that would allow you to wear different shoes/ belts/ cardigans/ jackets/ jewellery to change up the look however you wish. And yes, I totally agree with you that there’s such power and confidence when you can sew and have control over how you present your way to the world. I am reading it right now and am in the process of putting together my inspiration style images. I like the advice to be very specific about what you like and don’t for looks – for ages I’ve said I like cardigans over tops but it wasn’t until I really looked at hundreds of Pinterest images that I realized I don’t like the tops being longer than the cardigans or the cardigans being past the hips. I love drapey tops but again only if they finish around the hips. It has been very helpful in clarifying the exact style lines I like. And of course I could have done this before but having the book to work through helps a lot. I’m not sure I like the “outfit formula” approach but I’ll give it a try and see. I also appreciated her brief mention of denim as a neutral as I use denim that way yet hadn’t articulated that it filled that spot in my wardrobe. I’m with you on the “just try things on” frustration. It reveals a fundamental lack of understanding of the challenges of curvy/plus size shoppers – if I could easily try on every style of outfit I thought I might like, maybe I’d have a better developed sense of my personal style already. I might have to check my local library for this one. Generally speaking, I don’t have a “wardrobe.” I wear some kind of weather appropriate top with jeans, every day, year in year out. I’m retired and have chickens and a very large veggie garden. Going out just isn’t my thing and there’s no reason to dress up (nor do I have a desire to). That said, once every couple of years I suddenly need nice clothes – daughter’s graduation in the city, trip to see my parents, something. And of course when these events come up, no way do I have time to sew up much more than a single item, if that. Maybe if I look at my closet with my “yikes I need to dress up” hat on this book will have some ideas for me. One technique I have used to cull my “wardrobe” is to just pretend I’m getting dressed. Which items would I actually choose? Now put those aside. After a week or two’s worth of iterations the clothes that will never get worn are left, because by time I’m that far down my preference list the things at the top will be clean again. Unless there’s something special in that pile it gets easier to toss those. This probably only works for me because of my limited needs though. I just found her book this week! It is supposed to arrive today or tomorrow with my textbooks for my summer courses. Great minds! Your view is making me more excited! I’ve been currious about the “capsule wardrobe” movement, but have never read anything more than a few blog posts nor done any of the exercises available. My mother always taught me to buy items I love, that make me feel good, and flatter. Flattering, in her vernacular (and now my own), is an item that lets your personality shine, that makes you feel comfortable and free to be you. Her mother was a tailor (who taught her these fundamentals) and she (my mother) is an artist, so their focus was more on individual tastes and less on body type tropes. While I feel fairly confident in my own wardrobe and clear out my least favorite pieces at least twice a year, I think this movement is fantastic! Thank you for this series and for your well written review, Jenny! I read the book and I did think that some of the exercises were smart and original. I’m glad that other people have found it helpful. I like that you pointed out it’s body neutral-to-positive approach. I do wish the images included a broader range of bodies and styles, though. I enjoyed reading through the super-methodical process, but I wasn’t about to actually do any of it (I had neither the time nor inclination). I’m kind of over style books. Too many of them, this one included if I’m remembering correctly, conflate having the perfect wardrobe with having the perfect life. Plus, the emphasis on perfection and appearance totally rankles me as prescriptive femininity and implying women’s value is based on appearance. Does anyone else feel like that, too? Yes, yes, a thousand times YES to your last paragraph, and yesyesyes to the power of infinity your sentence “the emphasis on perfection and appearance totally rankles me as prescriptive femininity and implying women’s value is based on appearance”. That said, a style book that is body-neutral-to-positive is at least a step in the right direction, certainly. I think it’s possible to care about your appearance without implying that it’s a measure of your value, and I don’t think this book implied it anywhere, or said that clothes will give you a perfect life. I do totally agree that it would have been nice to see more diverse bodies in the models, though, and for her to maybe more explicitly acknowledge that the “just go to the shops and try things on” approach isn’t going to be possible for everyone. Yeah, I shuddered right along with you when I imagined having to go to a shop. What a nightmare. Definitely why I got more serious about sewing garments. Although to be fair (and again this is from the point of view of not having read the book) that is how clothes happen to most people! Even most curvy people or people with proportions that don’t work with RTW have no real alternative to trying on clothes in shops or ordering online with a view to trying on at home and returning if necessary. The book isn’t aimed at people who sew, as far as I’m aware. As an aside the more I read the blog the more I wondered why these fashion types don’t do more of their own sewing! Seriously, what are the chances of finding the item you want, in the style you want, in the colour you want – for anyone? Especially if you’re someone who finds it important to have your own style and not be following the dictates of the high street. Right?! I kind of laughed to myself at the idea of being able to walk into a store and try on like, blush pink blouses and minimalist pants. Absolutely, yes. It’s been awhile since I read it, and I felt like she said the word “perfect” a lot (again if I am remembering correctly) but I couldn’t quite remember the context, so thanks for clarifying. Now that I think about it, I did like her examples of people who were like, “I moved to from the city to the country and need a more appropriate wardrobe” (or whatever the example was) because it felt like pretty realistic reasons to someone would want to reassess. It was more like clothes were a pragmatic feel-good tool than a measurement of value. Thanks for pointing that out. I have not read this book though it sounds intriguing. However, I wondered if you could elaborate on how it works even if you can’t go try on lots of things in stores to see what you like. I’ve seen that piece of advice before and my emotional reaction is more or less what you describe above. So if that isn’t an option, what strategies are available for figuring this style thing out? Also. Check out the “sewing for my curves” series here on the CSC – each contributor shares their measurements, height and body shape, and you can see different styles on them for inspiration on what might look great on you too. Thank you. I think I’m also just going to TRY some things. If they don’t work out, I can treat the $, time, and energy espended as being spent on learning stuff. FWIW, if I’m trying a completely new style for me, I’ll sew up a quick muslin just to get an idea of how it might look. It gives me a quick starting point, if nothing else. I can go from there and decide if I want to invest the time, money, and energy on pattern alterations to sew up a “good” version. Try on clothes at a good resale shop. Someone has already gone through the trouble of finding a “winner”! Cheers for the useful review! I haven’t read the book but have had a look at the blog recently after it was recommended on here and found it full of useful thoughts. It definitely did strike me that as sewists we’re at a massive advantage here. One useful thing from the blog was the idea that if you have no idea what your style is or where to begin on it, start by making a list of things you don’t like and why. That can help lead you to what you do like. Yes I think that’s a great exercise! Also forces you to face up to what you actually wear, e.g. I can aspire all i want to the idea of wearing heels on a daily basis , but it’s never going to happen! Like you I am a person that wears what fits. I do sew but am struggling with the adjustments. I have tried to use the idea that at least two items should be able to be worn together but still a closet full of clothing that only goes with its self. I like the idea of a book that tells you how to do it but I have read a lot of books and have a problem applying them to me. Ah well, I will keep working on it and one day the light bulb will shine. I have just read the book with trepidation but was surprised by how much I liked it and it has given me a less cluttered approach to looking at my wardrobe. I did the “take a photo of your outfit each day for 2 weeks”, I actually did 10 days but it was enough for me to see what I liked. I have since had a massive cull of my “ahem” 3 wardrobes and I feel I can now see the wood for the trees. It’s the first time I have thrown out me-made clothes as I always felt the effort gone into them meant I had to keep them but that just caused me to have loads of stuff I never wore. I will now start on my stash too! That’s great! I found that exercise very illuminating too: I didn’t like *most* of what I was wearing, and I was always choosing my most comfortable clothes. So now I’m working on making more appealing comfortable basics! Exactly! I found I put together nicer outfits depending on where I was going but sometimes when I was at home I would just hope the postman wouldn’t ring the bell as I felt too shabby to be seen. I need to up grade my “round the house” look, make some stylish jogging bottoms and sweatshirts, I just made the Style Arc Jody Hoody and it’s perfect for days at home. I have not read the book, but I am in the second year of trying to reduce my wardrobe. I no longer work due to health issues.. My reality is that I need comfortable clothes for 90% of the time. Loose fitting works for me, comfort is my priority. My reality is that I need other clothes to wear to church, the occasional dress up event, and for weddings & funerals. Given that, it should in theory not be hard to weed out the wardrobe! However I am finding it very difficult! Aside from the three sizes for weight fluctuations, I have more than I would like in terms of space and need. I like my flamboyant clothes even if they do get worn rarely;perhaps that is the excuse to make more of those clothes and replace the boring collection of t-shirts in long/short sleeves!